Prepare the chickpea saute: Heat 2 t. olive oil in a large nonstick skillet over med-high heat until very hot and the oil is just nearing the smoking point. Toss the tomatoes with 1/2 t. sugar and a sprinkle of salt & pepper. Add to the pan and saute until the tomatoes just begin to burst and become lightly blistered. 1-2 minutes. Transfer to a plate, set aside. Reduce heat to medium, add remaining 2 t. olive oil and 1/2 T. butter and the leeks. Saute the leeks until very soft, about 10 minutes, add garlic, saute about 1 minute. Add the chickpeas and chicken broth, reduce the heat to med-low, cover the pan and let the chickpeas warm through for a bout 5 minutes. Uncover, add the baby kale, cook and stir until just wilted, this takes only a couple minutes. Stir in remaining 1/2 T. butter and 2 t. lemon juice, adjust the seasoning. Gently fold in the cherry tomatoes. Cover pan and keep warm until serving time. Cook the fish: Meanwhile, pat the fish dry and season with salt & pepper. Dredge the fish in the flour and pat off the excess. Heat another pan over med-high heat. Add 1 1/2 t. canola oil and 1 1/2 t. butter. (Butter should foam up and start to brown and smell nutty.) Add half the fish and cook until browned and cooked through, 2-3 minutes per side. Remove first batch of fish to a clean plate, wipe out the skillet with paper towel. Return pan to the heat and repeat this step with the remaining butter, canola oil and fish. 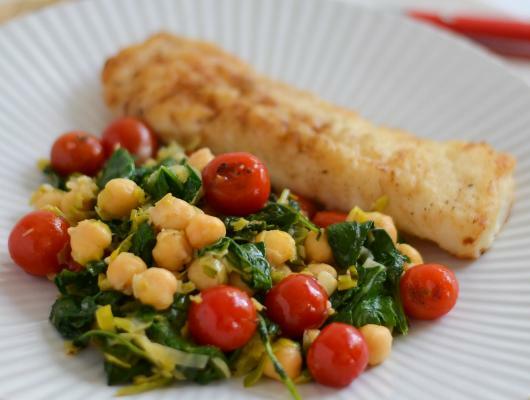 Serve with the chickpea saute and lemon wedges. 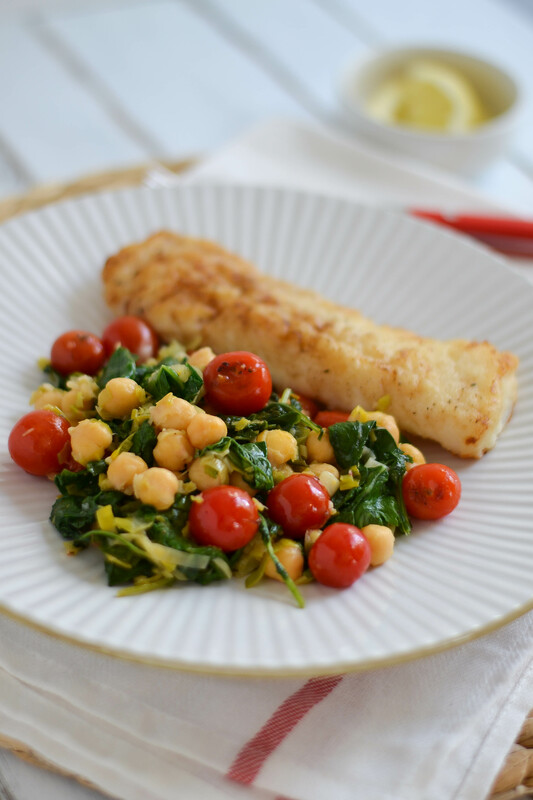 Simply prepared, pan-seared cod with a saute of chickpeas, leeks, baby kale and seared cherry tomatoes.